The PainMaster is a real self-contained disposable microTENS device cleared for sale by the FDA (510k #K013167). It features a low profile electronics stack comprised of pad, battery, control circuits, LED and lead wire to the other pad. The system turns on when applied to the skin, and off when removed. This design is simple and ingenious at the same time. It is designed to be worn for long periods of time, hours or days. The PainMaster model 7200 pads are full prescription strength and are sold through health care professionals. The pads are completely waterproof can even be safely worn in the shower or during intense activity. Here are some of the technical highlights of the PainMaster system. 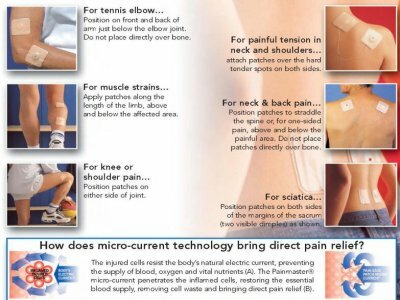 Microcurrent stimulation of the type used in the PainMaster 7200 system has been used in over 233 positive peer reviewed studies. Several studies using the PainMaster pads have shown their effectiveness in pain relief and tissue repair.